There always is a top dog, no matter what job or style of music you do, its just the way it works. In the Black Metal, it is no different and there is one that stands alone. Venom may be the classic figurehead in BM, not to mention the true innovators, but right now it is American Satanic warriors Abigail Williams who leads the bloodthirsty pack. Symphonic to a point yet so inherently stark, haunting and raw in its approach, Abigail Williams has taken charge of the BM movement worldwide with talent and unbridled satanic venom. Combining their previous style into their newer style of bare boned BM it is that step forward in there development that have made them in a class all of themselves. Powerful and very blatant they are the best of what the genre has to offer and "Becoming" is the soundtrack for it. With six monster songs offered up, this is a album that has balance and power in perfect sync. My favorite track is the haunting and illustrious epic of 'Beyond The Veil'. At seventeen and a half minutes, the song does not comes up being drawn out and boring as some do but this is a piece of epic music that does tell a very macabre story. That ebbs and flows as the listener gets into the story and propels you into that evil that lurks waiting for the unwary. From the haunting start to the powerful movements that leap out at you at every turn it is truly a perfect epic. 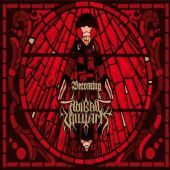 Say what you will about Black Metal and Abigail Williams, this album showcases both of the genre and band each in a new light. It shows how the whole BM scene has got this incredible collection of extraordinary visionaries and mind-blowing musicians that are putting out music that is simply as brilliant as it is dark and foreboding. This is BM’s finest hour.